GP Test Cyp 250 (Testosterone Cypionate). 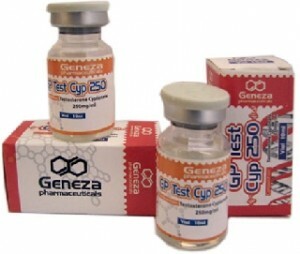 GP Test Cyp 250 by Geneza Pharmaceuticals is an injectable steroid which contains 250mg per 1ml of the Testosterone Cypionate. GP Test Cyp 250 (Testosterone Cypionate) testosterone is main androgen in body thus best mass and strength builder. Therefore athletes use this product very often to get above mentioned results. GP Test Cyp 250 (Testosterone Cypionate) is similar to Testosterone Enanthate (GP Test Enath 250) even their half liveand active life periods are different, they are similar. Injections are normally less frequent for cypionate.